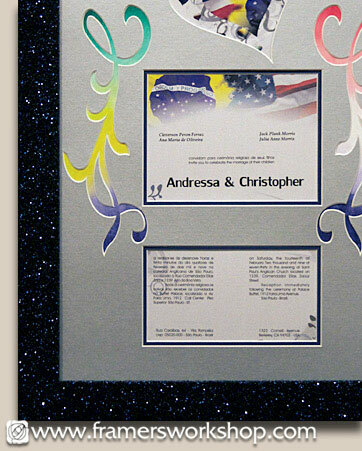 Metallic Mat & Glitter Frame! This unusual wedding invitation was designed by the bride and groom to blend together the flags and national colors from their two native countries, Brazil and the United States. They wanted something unconventional, eye catching and decorative to frame their innovative design. A metallic silver top mat was selected with a dark blue under mat for the two rectangular openings. A heart shape was cut into the mat to outline the design of the invitation. On each side of the mat is a scroll work cut out with a hand painted watercolor wash beneath, showing a gradient blend of the national colors. The frame itself is a glittering midnight blue.